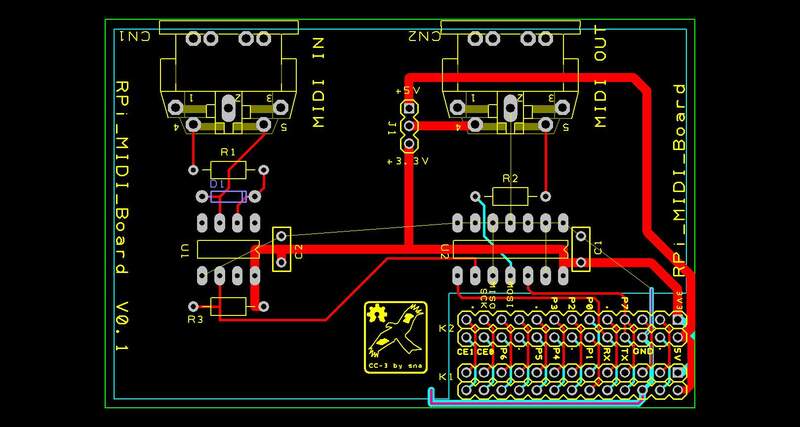 This entry was posted on Sunday, March 18th, 2012 at 8:41 pm and is filed under DesignSpark, Electronics, PCB, Raspberry PI. You can follow any responses to this entry through the RSS 2.0 feed. You can leave a response, or trackback from your own site. usb audio inputs. ( porta studio me thinks ). There should be a resistor from MIDI Out pin 4 to the 3V3/5V rail. This prevents an external cable fault or incorrect cable usage shorting pin 4 to 0V and blowing the supply. Having missed the 220R resistor off the +5V line on the MIDI out connector that’s shown in the MIDI spec a user could short the +5V line to ground. Yes, I’ve added the resistors as suggested. I’ve revised the size of the board to be smaller and fit the MiniPiio format (40 x 50mm) as I’ve been using for other designs. I’ll post the new design shortly. Will you be selling pcbs at any point? Hey, this looks very good. I’m about to start(when i get my rPi) a project with arduino+rpi+pd. But i’d need two midi inputs. And no output. Is it possible to do? Getting two MIDI inputs from the RPi expansion port might be a bit tricky as it only has one UART interface. You out use a USB MIDI adapter but if you really want to use the RPi expansion port (which does make a nicer packaged solution) you could use a dual MAX3109 UART-SPI chip from Maxim. That would seem to miss a trick seeing as how one can chain MIDI devices, no? Does this make MIDI more reliable on the rPi vs a USB midi interface? How do you deal with the non-standard baud rate of 31.25 kbaud? Will the RPi’s UART do that? The Pi doesn’t support 31.25K baud directly but you can trick it by messing around with the system clock and baud rate registers. great project. How’s the CPU usage with MIDI traffic? Lower than with a USB interface? This should also help keeping USB free from other things that need it. Are these going to be made again sometime soon? Do you have the circuit diagram available if I would like to get some made? I’ve made a few sample boards but getting the Pi to generate the correct baud rate is tricky. A litttle late to comment maybe, but I had a question about this setup. Maybe you could point me in the right direction? How does one setup the configuration for alsa-midi to know what port to use etc, once the hardware is connected. I know you are using the UART rx and tx pins, and I can understand that you need to change the UART clock rate, but I can’t find any info about how to configure it beyond that. I have searched pretty hard to find out myself.